I'm the kid you saw on TV. Remember the little freak who took a crap on his parents' oak-stained kitchen table when they confiscated his Game Boy? Remember how the camera cleverly hid his most private parts with the glittery fake daisy and sunflower centerpiece? That was me. Gerald. Youngest of three. Only boy. Out of control. And with that introduction, A.S. King has our full attention. Gerald Faust is an angry teenager. But he was also an angry kid. And he knows why he's angry too. It all began when a reality TV crew showed up at his house when he was five years old. Gerald's mom thought that Network Nanny could solve all their problems, but really, the show just exacerbated them. Now Gerald is seventeen and the implications of what reality TV did to his family has manifested in quite a dysfunctional life: he has no friends, his mom insists that he belongs in special ed even though he has no disabilities that hinder his learning, his beloved sister Lisi abandoned the family as soon as she was old enough, and his other sister, Tasha the psychopath, has her loser boyfriend living in their basement because their parents are too afraid of her to kick them both out. So Gerald lives his life festering in his own rage waiting for the day that he will end up in jail. And he knows that if he doesn't get out of that house just like his sister did, jail is his best case scenario. But one day, Gerald meets Hannah, a girl who works at the convention center with him and someone he immediately begins to fall for. And despite the fact that his anger management coach tells him to stay away from girls, Gerald can't stop thinking that Hannah is the only good that he can see in his world. Could she be his ticket to a new life away from his "dysfunctional is an understatement" family? I want to start off by saying that A.S. King is a genius. The premise for this story has been a long time coming and it's an important one as it is an unflattering commentary on our reality-TV-obsessed society. When King came to Nicola's in Ann Arbor back in May to talk about Ask the Passengers she also read to us from this new novel and talked about her inspiration for writing it: she and her husband had just moved back to the U.S. They don't ever watch TV, but when someone mentioned something about the Gosselin family, she was horrified that parents would exploit their children on TV this way. It made her stop and think about what that kind of experience could do to a kid later in life. Thus Reality Boy was born. This book is an intense, page-turning read. Pretty much everyone in Gerald's life is a whack job. The reader feels no empathy toward anyone in his family except for his sister Lisi, whom Gerald misses desperately as she was the only ally he had in the house. Gerald's oldest sister Tasha elicits fear in his very core as he has no idea what manipulative or violent thing she will do next, Mom is completely blind to Tasha's psychotic behavior and Dad stays late at work to avoid the misery in his own home. 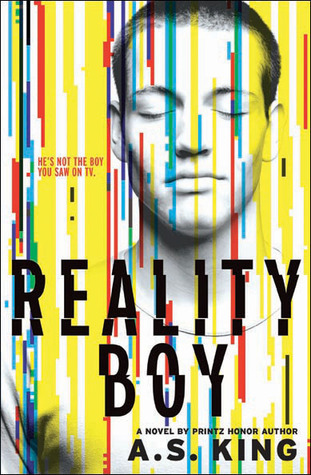 With all of that intense conflict, it's no wonder that Reality Boy is one of those books that makes your heart race and sends your blood pressure skyrocketing as you read it. The only part of this story that doesn't quite add up for me is how Gerald is still so famous despite the fact that he was only on two episodes of Network Nanny twelve years prior. Gerald's participation in a reality TV series wasn't like Jon and Kate Plus Eight or Here Comes Honey Boo Boo where the "characters" are always the same every week. Yet whenever Gerald is out in public, people frequently seem to recognize him and his classmates still give him a hard time for being "The Crapper" even though that happened when he was five. It just seems like twelve years later is a long time for the general public to be holding onto knowing who he is. At the same time, I think King used this back story as a way to show that exploiting your children on reality TV, even in small doses, leaves a long-lasting impression and permanent emotional damage. But other than my small bit of befuddlement, this is an amazing book that will stay in your memory long after you finish it. It is a must-read and a must-share-with-others kind of book. I could see this being a great book club or literature circle selection because of all of the discussion-worthy elements that fill its 300+ pages.